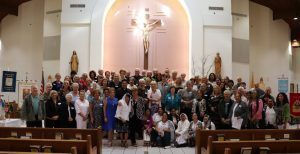 The 49th Annual Acies of the Manasota Curia of the Legion of Mary took place March 23 at San Pedro Parish in North Port, home of the Our Lady Queen of Peace Praesidium. Bishop Frank J. Dewane celebrated the Mass for the gathered member which represented nine different Legion of Mary Praesidium’s from across the region. Bishop Dewane praised the Legion of Mary for its commitment to carrying the message of the Blessed Virgin Mary to others. That message includes giving oneself over to the Lord by doing what He asks without question and without fail. Annually, during the Acies ceremony, the members consecrate themselves to Mary by renewing their Legionary Promise, so that they may better work in union with the Blessed Virgin as they do their Legionary battle against the evils of this world. In this consecration the members open their hearts to Mary, so that Our Lady may guide them and bless them through the year. It is said that one cannot be truly devoted to Our Lady’s Legion if one does not attend this ceremony, as you will not have within you her spirit. This ceremony is held as close as possible to the Feast of the Annunciation of the Lord (March 25). The Curia Spiritual Leader for the Legion of Mary within the Diocese of Venice is Father Ronnie Sison, who is also the Parochial Vicar of Incarnation Parish in Sarasota. Following a lunch, the group participated in Eucharistic Adoration which included the Chaplet of Divine Mercy.